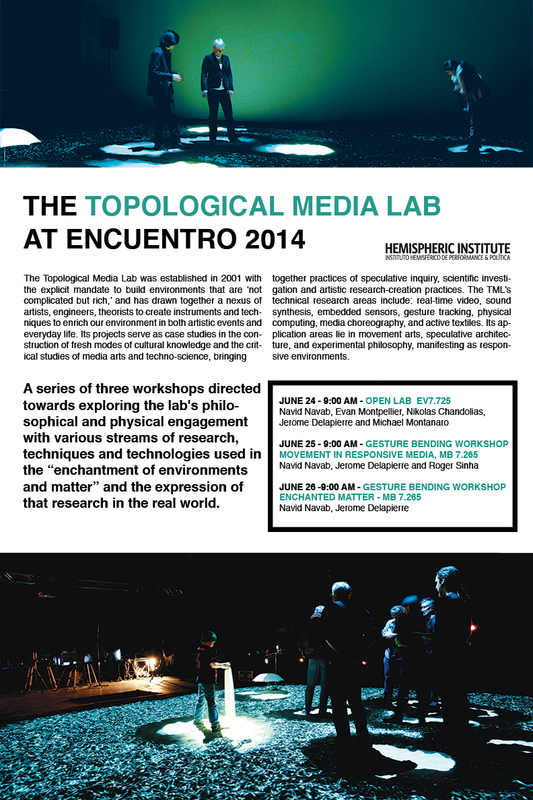 The Topological Media Lab will host 3 workshops during the Encuentro festival the 24th, 25th and 26th of June 2014. A series of three workshops directed towards exploring the lab’s philosophical and physical engagement with various streams of research, techniques and technologies used in the “enchantment of environments and matter” and the expression of that research in the real world. The Encuentro is for registered participants only. About Encuentro: The Hemispheric Institute of Performance and Politics and Concordia University invite scholars, activists, and artists of all disciplines to examine the practical, ethical, aesthetic, theatrical, and performative dimensions of manifests and manifestations throughout the Americas at the ninth Encuentro, to be held in Montréal, Québec, June 21-28, 2014.